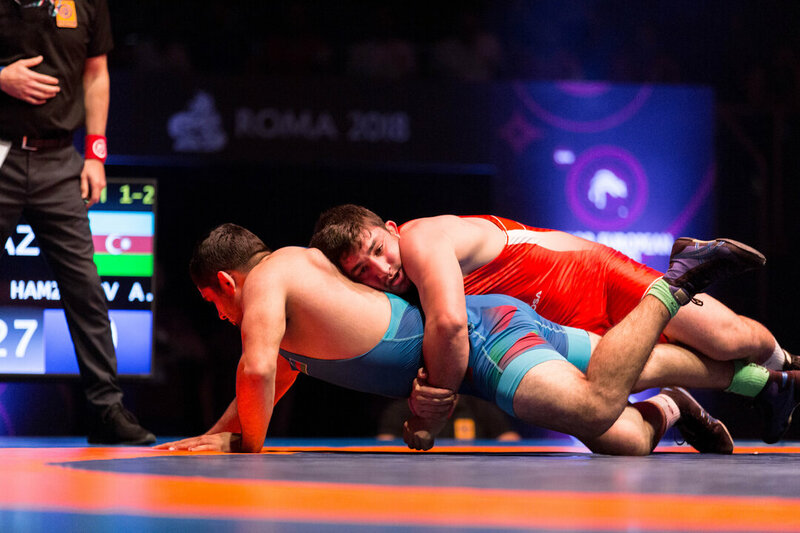 ROME, Italy (August 2) - Russia’s Greco-Roman squad won four gold medals on their way to a team title, and Russian women picked up where their Greco-Roman countrymen left off, dominating the European Junior women’s wrestling competition to the tune of three gold medals. Russia's three gold medal performances today matched their overall gold medal output for the entire women’s wrestling competition at last year’s Dortmund European Championships. Veronika GURSKAYA (RUS), Aleksandra NITSENKO (RUS) and Khanum VELIEVA (RUS) each won their respective weight classes and took home a European gold medal. This was Nitsenko’s first time winning an age-level continental championship, while Gurskaya and Velieva have won at least one age-level European gold medal. Gurskaya, who last won a European title in 2013 launched the Russian gold medal parade, defeating Aynur ERGE (TUR), 8-6 in the unpredictable back and forth 55kg gold medal bout. Though Gurskaya was the aggressor the entire match, she continued to allow Erge to stay in the match by turning defense into offense. The three-time age-level world bronze medalist used a fireman’s carry and gut wrench in the opening period to command the 6-2 lead heading into the break. But it was Erge, Turkey’s four-time European representative who remained patient and tied the match with two minutes remaining, scoring a four-point head-lock as Gurskaya pushed the pace on the out of bounds line. With 90 seconds left, Gurskaya shot a double-leg and grabbed the match-deciding takedown, ultimately winning the bout, 8-6. Aleksandra Nitsenko used two double-leg takedowns and a step-out to storm through Darya SINKAVETS (BLR), 5-1, giving Russia back-to-back golds medals, and more importantly, her first continental championship. Khanum Velieva, the three-time age-level world champion gave Russia their third gold medal of the day, shutting out Yauheniya ANDREICHYKAVA (BLR), 7-0 in the 68kg gold medal bout. Velieva obtained her third age-level European title by scoring seven points off two takedowns and three step-outs. Russia (100 points) leads Turkey (74 points) by 26 points heading into the final day of women’s wrestling, but Russia still has two finalists, while Turkey only has one. The day five medal matches begin Friday at 6:00 PM (local time). Big Move from Day 4 of the Junior European C'Ships #Rome2018 ! BRONZE - Ellen RIESTERER (GER) df. Magdalena Maria MAJOS (POL), via fall. ROME, Italy (August 5) - Thanks to impeccable performances by Akhmed SHOKUMOV (RUS) and Azamat ZAKUEV (RUS), Russia added two additional European Championship gold medals and brought their overall tournament total to thirteen gold medals. In addition to the thirteen individual gold medals, Russia also obtained team titles in freestyle, Greco-Roman and women’s wrestling. Shokumov and Zakuev, Russia’s third and fourth freestyle champions each cruised to victories in their gold-medal matches, ending their bouts early by fall and technical superiority, helping Russia (141 points) squeak past second place Azerbaijan (136 points) and third place Armenia (135 points). Akhmed Shokumov was manhandling Dzhemal Rushen ALI (BUL) in the 74kg title match before picking up the second-period fall. Shokumov grabbed a pair of opening period takedowns, shutting out Ali while controlling the 4-0 lead after the first three minutes. In the second period, a deflated Ali got to his offense and spun behind Shokumov, but was unable to get the Russian’s knee to touch, and the wrestlers were brought back up to their feet. Shortly after, the frustrated Ali looked for a homerun throw, but Shokumov pancaked him to his back and scored the fall, picking up Russia’s third freestyle title and their twelfth overall Junior European Championship gold medal. 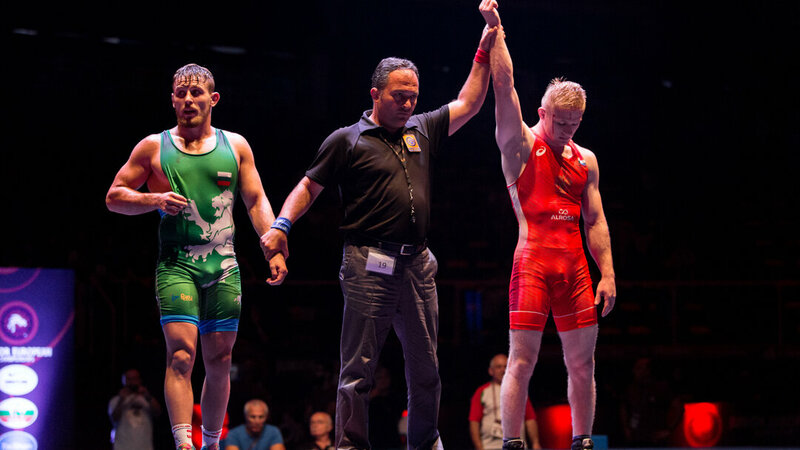 Returning European champion, Azamat Zakuev crushed Askhab HAMZATOV (AZE), 10-0 in the 92kg gold medal bout. Zakuev blazed out to an eight-point lead in the opening period, transitioning to a pair of gut wrenches from two separate takedowns. The Russian capped off his title run with a second period cross-ankle-pick, giving him the ten-point advantage and back-to-back junior continental championships. 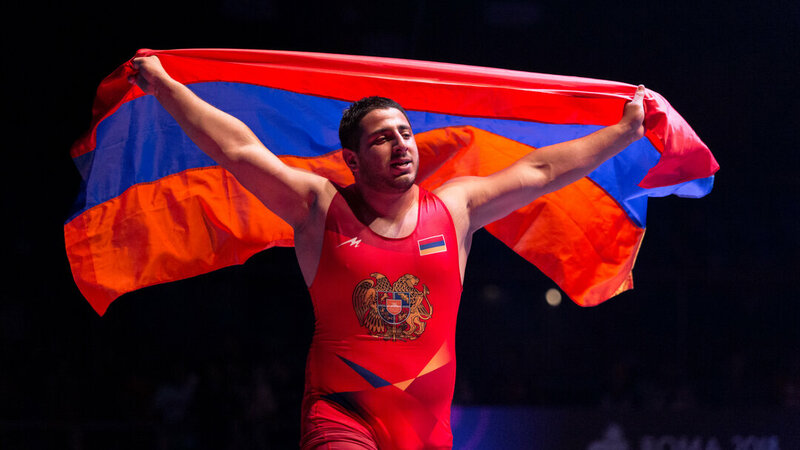 Russia wasn’t the only nation busy winning a pair of gold medals on the seventh and final day competition , as Armenia’s Vazgen TEVANYAN (ARM) and Hovhannes MAGHAKYAN (ARM) were also crowned European champions. Vazgen Tevanyan, last year’s Cadet European Championship runner-up defeated Intigam VALIZADA (AZE), 5-2 in the extremely slow 61kg gold-medal bout. The opening period was filled with underhooks and fake shots, but Tevanyan was able to score the periods only point with a step-out that gave him the 1-0 lead into the break. Tevanyan added another step-out to open the second period but fell behind 2-2 on criteria after forfeiting a deep two-point double leg. The Armenian wrestler regained the lead with 90 seconds left, scoring his third step-out point of the match. He closed out the bout by stopping Valizada's throw attempt, scoring his first offensive points of the bout and winning his first European title since claiming the gold back in 2016. In the 125kg gold medal bout, Hovhannes used a left-side underhook to slow down Yurii IDZINSKYI (UKR) and won the bout, 4-2. Maghaky gave up an early takedown and trailed 2-0 right out of the gate. The two-time age-level runner-up rebounded before the period ended and threw the Ukranian wrestler with a monstrous four-point throw, taking the 4-2 lead into the final three minutes. After a scoreless second period, the match ended 4-2 and Armenia, who finished one point behind Azerbaijan walked away with the third place team trophy.